Attendees at last week’s Faculty Research Celebration learned about topics as diverse as the Massachusetts hip-hop scene, RNA sequencing in mice, and human rights and peacebuilding in Spain. What tied these three presentations together was mentorship. While the annual faculty research event typically features three professors showcasing their work, this year was a little different. The 2016 celebration, titled “The Teaching Soul: Research and Mentoring,” showcased faculty members working with students supported by the Beacons Student Success Fellowship Program. 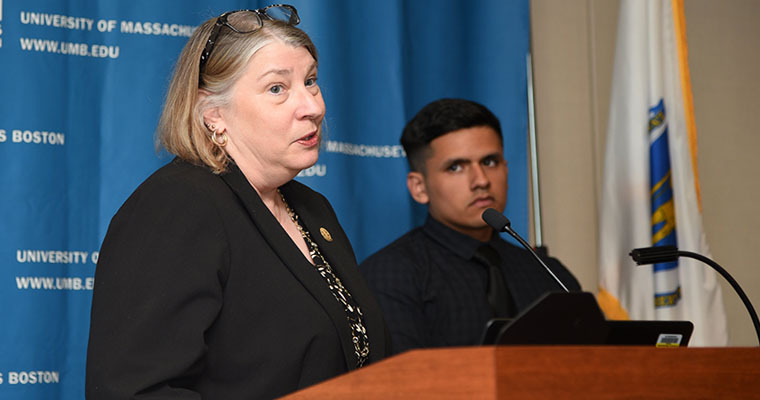 UMass Boston Professors Pacey Foster, Jill Macoska, and Alan Stoskopf shared the stage with their undergraduate students, each speaking about a high-impact research project on which they collaborated on as mentor and mentee. 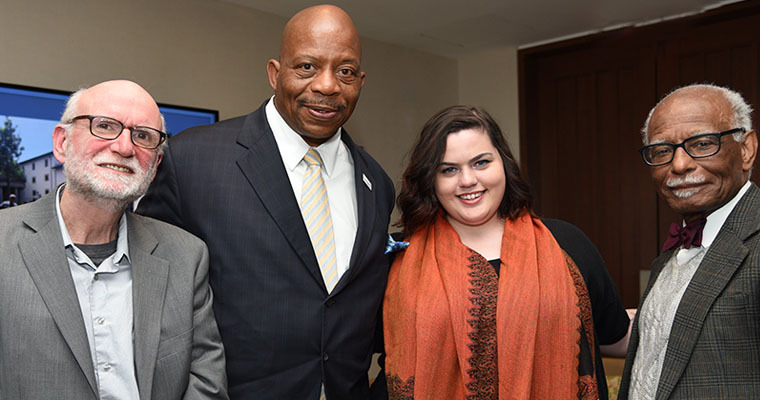 “Not only do we celebrate our faculty’s exploration and creativity across their respective disciplines, we also express gratitude for their mentorship of our students, who have followed in their footsteps to make discoveries in the fields of music history, cancer health, and peacebuilding,” Chancellor J. Keith Motley said. American Studies student Joel DeMelo worked with Associate Professor of Management Pacey Foster to index the first set of tapes and prepare a database for the Massachusetts Hip Hop Archive, which Foster launched with University Archives and Special Collections in 2014. Through the Mass Hip Hop Archive, DeMelo collaborated with legendary Boston musician Killer DJ to track down and reissue his long-lost 1990 single “Jordan” on vinyl. They pressed 300 singles, providing Killer DJ with the tools to “put something out there,” which he hadn’t done since the 1990s, and ultimately created a dialogue between the Boston hip-hop community and academics who want to preserve and celebrate its history. Through the mentorship of Center for Personalized Cancer Therapy Director Jill Macoska and others in her lab, biology major Diego Almanza went from working as a lab manager ordering supplies and cleaning glassware to sequencing and analyzing RNA and presenting his work at conferences. He will graduate with honors this month, and plans to pursue a doctoral degree. Almanza helped to isolate, prep, and sequence the RNA from the livers of mice to analyze non-alcoholic fatty liver disease induced by metabolic syndrome. He found that a mouse’s fatty liver presented a pre-malignant signature consistent with early stages of tumorigenesis, or the formation of cancer. Honors College professor Alan Stoskopf brought students Michelle Chouinard and Sarah Bolden on a trip to lay the foundation for an international community of inquiry with Autónoma and Deusto universities in Spain. During 10 days in Spain, they got to see how their Spanish colleagues approach human rights and peacebuilding issues from a variety of perspectives. The Beacons Student Success Fellowship provides UMass Boston students with financial support for experiential learning activities such as internships, service learning, civic engagement projects, and mentored research experiences in the summer. Watch the three presentations on the UMass Boston YouTube channel.